Floral tributes outside Halifax Bathrooms, Queen's Road, after 16-year-old girl dies in car crash. A “devastated” community is in mourning following the tragic death of a teenage girl in a car crash. Ifza Bi was killed after the car she was travelling in collided with the wall of the Halifax Bathrooms store in Queen’s Road on Sunday night. 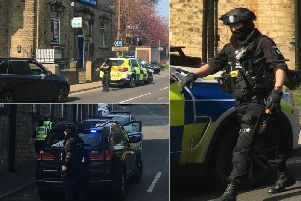 The local teenager, a Year 11 pupil at Sowerby Bridge High School, Albert Road, was taken to Leeds General Infirmary but died of her injuries on Tuesday. Floral tributes have now been left in memory of the “bubbly” and “lovely” 16-year-old, close to the scene of the crash. A statement from Ifza’s family thanked the local community for their help. Councillor Faisial Shoukat (Lab, Park), added: “The whole community is devastated and on behalf of the family, I would like to thank the community for all their support. “It’s an unfortunate and very tragic accident, we have a very tight knit community so things like this really affect it. “Ifza’s friends have described her as a bubbly and lovely person, who was looking forward to the future and going into further education. A statement released by Ifza’s school said she would be deeply missed. It read: “This is a tragic event and on behalf of the school we would like to offer our heartfelt condolences to Ifza’s family. “She was a lovely and sincere girl whom we were proud to have been a member of Sowerby Bridge High School. Our school community is devastated by her loss. “We are a strong, inclusive community and our pupils and staff have been distressed by this news. Ifza’s funeral took place last night at the Madni Mosque, Gibbet Street, where more than 2,000 people were expected to attend. Enquiries into the crash are ongoing and two other females, the 22-year-old driver and and a 28-year-old rear passenger are still being treated for their injuries, which are not thought to be life threatening. Anyone with information is asked to contact the Major Collision Enquiry Team via: 101 and quote crime reference: 13150259343.